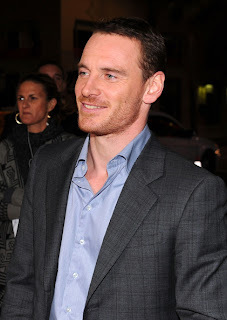 Los Angeles had Michael Fassbender all to itself this week when he was in town to attend the LACMA and the AFI festival to support Shame and Haywire. He also participated in several media junkets including Variety in discussing all his current projects. It's been a very busy week for him, and if you had the opportunity to see or even meet him, you were indeed lucky! Of all the cities Michael has visited in the past 3 months, I would say that being in Los Angeles was important as it is the city that has the most concentration of AMPAS members who physically live and work there. Getting his face out there, in the flesh, showing that megawatt smile and answering so many questions tirelessly, is all great PR, and the professional that Michael is, he lived up to and exceeded expectations. Angelenos had a few times to see Shame this week alone, and most of them are people in the industry who have formed opinions already about what they witnessed. Based on what I have been reading, the film and especially Michael's performance, has impressed a lot of folk. As usual, there are some people who did not like it as much, and that's to be expected. But for the most part, Shame has accomplished what it set out to do in LA and it was to excite people about the film and continue to hog the hot topic spot in entertainment circles. Michael is probably on his way back to UK/Europe now where there are more festivals, and potential awards to be won by him. It never fails to impress me how happy he seems to be at these events, and his confidence in his work is admirable. There is a lot more to watch from this moment on. If you think it has been crazy already, you haven't seen anything yet! Thanks to Sam and Tracy for kindly signing the guestbook! And LJ, thank you very much for the DSM 5 information about adopting Hyper Sexual Disorder into that psychological reference book. I read the diagnosis and it is compelling and those very same behaviors were depicted in Shame by Michael's character, adding to the believability of that role. I hope the American Psychological Association use this film as a resource to justify including Hyper Sexual Disorder as a mental disorder in the next edition. I would like to take a moment to announce that FF has a new admin team member! Dionne has graciously accepted a new role here at the blog to assist me and Chele Belle with admin duties. She has demonstrated great enthusiasm in being a fan of Michael Fassbender, and her support for FF as a regular and energetic commenter has not gone unnoticed. Like Chele, she will create blog articles to help keep FF updated especially when work, school, and travels keep me from the blog for long periods of time. Both team members will also have the ability to remove offensive counter-productive comments. No one should be surprised if their comment is deleted from Fassinating Fassbender if it verbally assaults Michael Fassbender, me, and the utility and purpose of this blog; free speech does not apply to attacks. As Michael’s celebrity profile increases and as the award season is upon us, traffic to the blog will increase and we need to take steps to prepare for this next fan base evolution. Please take a moment to welcome Dionne to her new role! I'm so happy to 'officially' be apart of the team! I believe that Michael will get an Oscar nomination for Shame. From the articles I've read, it appears that there is enough interest in Shame, and especially Michael's performance to recieve an Oscar nod. Fox Searchlight is doing a great job so far, in making sure that Shame can not be ignored! I know it'll be a tough call, but I say it will happen. I've mentally prepared myself for more 'fans' to come, the good, the bad, and the ugly. I look forward to see Michael's continual growth and success, along with all you other Fassinators. Welcome Dionne!! =) I look forward to reading your articles! Unfortunately we didn't see him at LACMA, but I heard via @shamefilm on twitter that he and Steve McQueen are going to be at the BAFTA LA screening of Shame today for a Q&A session. And I really hope he gets nominated, albeit the stigma of the NC-17 rating! I'm sure you'll be great in your new role! The more this site has behind it, the better! CONGRATULATIONS DIONNE!!!!! !cant wait to read your posts! @dshultz Thank you, I agree.